Usually sequels fall short – but not this time! Ocean and the gang returned with one more member as they attempt their biggest heist ever. All the cast members shine and it’s just as funny as the original. At one point, Julia Roberts’ character has to pretend she’s… Julia Roberts! Priceless. And why is 2004 special? It’s the year Diane Wolfe went on a cruise and enjoyed fresh beginnings, and Rachel Schieffelbein got married and had her first child! From the genius writer with connections, Samantha Redstreake Geary, comes an epic opportunity for writers - PHENOMENA’s EPIC HEROES CONTEST! Create an original SUPERHERO Story and/or Artwork inspired by PHENOMENA's track, "Fortress of Solitude“ in audiomachine's "EPIC HEROES CONTEST" for a chance to be PUBLISHED in the upcoming PHENOMENA album's companion eBOOK! Open Internationally April 15th -- May 15th. Go HERE for details. And I am honored to announce that I will be a contributing author to this first ever audiomachine eBook! Similar to Face Off, except they are making creature costumes similar to those seen in The Dark Crystal and Farscape. Ten creators compete, designing creatures based on the weekly challenge. It involves fabric, sculpting, and mechanization, and they are judged on concept as well as design and execution. Creations are judged on a real set design. Brian Henson heads up the project and is the top judge. Note that it’s also hosted by actress Gigi Edgley, who played Chiana on Farscape. 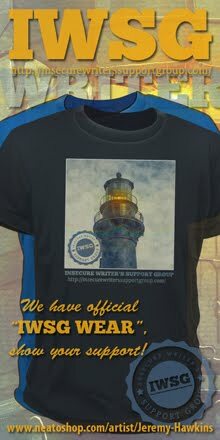 Fan of the Ocean movies? Following Diane and Terri? Think you could write a superhero story for audiomachine? Watched Jim Henson's Creature Shop Challenge yet? And what do you remember about 2004...? I love the ocean movies. I have watched them so many times. Jim Henson creature shop is so awesome. I ADORE the Ocean's movies. My favorite scene is in 13 when they are tearing up at the Oprah episode. I also love the end of 11 in front of the Bellagio Fountain. I actually saw them filming part of 11 in the Bellagio. Total thrill. I loved all of the Ocean movies! Has it really been that long since Space Ship One launched? Hard to believe all the films are 10 years old!! Facebook! Now I can say I haven't watched something. up, none of the Ocean movies. Though I have seen like a five minute or more piece of eleven and twelve while someone else was watching it. 2004 was a great movie year, like fine wine. Green Day! Congrats Alex and I'm so into this contest. Checked it out and a story is already forming. Jim Henson? Interesting, interesting. Face Off with puppets...interesting...probably cool. I loved Ocean's twelve. One of the most intriguing movies! Facebook has been going that long? And I still haven't joined up? Dinosaur status confirmed. Congrats on being selected to appear in the first audiomachine ebook! I can't wait to find out more about it! Hi to Diane and Rachel! I graduated from high school in 2004. That was an awesome year for me! When I started college that fall, Facebook was all the rage, though it was still an exclusively college thing at that point. It's odd to think that I've had a Facebook profile since almost the beginning. Is Brian Henson Jim's son? Regardless, that's a fun one. Diane is a dear. I don't think I know Rachel yet, so I'm going to hop over there. Thanks, Alex. Hellboy and Shaun of The Dead were my favourites. I still haven't seen the Ocean 11 or the sequals, but they're not on the Netflix. Hi Alex .. haven't seen the films - nothing strange there. Facebook is ten this year? I watched the tennis! I know Diane and admire her insights into publishing. While an audiomachine collaboration - that sounds such a wonderful project .. Awesome info about fellow bloggers. I haven't seen this sequel yet. I personally think 2004 was a great year for movies. I'd also add two of my all time favorites - Zhang Yimou's Hero and House of Flying Daggers - both stunning films! It kind of feels like Facebook has been around forever, so be reminded that it only appeared when I was in university is a little weird! I remember getting an invite from someone to sign up for it and thinking, "Hmm. Yeah, okay, why not." I enjoyed the Oceans movies. Hard to believe Facebook is only 10 years old. Diane is amazing. I have been following her for a long time. Congratulations on being a contributing author to the first audiomachine ebook. I remember seeing the original Oceans 11 but have not seen the others. 2004 I was living in Enniskillen N. Ireland, causing mayhem as usual. A movie with George, Brad, and Matt, I don't miss. Loved them. Another group of good movies. I'm a fan of Superheroes but don't know if I can create one. Brandon, and right after Face Off, it's two hours of coolness. Ray, when did that happen...? Sheena-kay, hope you come up with something good for the contest! Elephant, I haven't joined either! Robyn, he is Jim's son. George, yes! Sorry, I ran out of room. Rachel, you've been with it for a long time. World of Warcraft was 2004??!??? Yikes, I've been playing it for way too long, lol. Been watching the Jim Henson shoe too! I wish I could design creatures. And that contest sounds cool. I'll check it out. I think I've only seen the first Ocean's movie. Whoops! 2004 was also the year I went on an epic world trip all by myself (though I did stay with many friends and family members along the way :P ). Diane is a sweet person. Good to see her highlighted. She works super hard! Wow, or I guess, WOW has been around that long huh? Geez, it doesn't seem like it. All the Ocean movies are great! I just got home from watching Captain America - fantastic. Your review was spot on. Dianne is a wonderful lady, nice of you to choose her. Alex, you're so sweet! Thanks for including me. 2004 was a pretty great year! I have seen quite a few of the 2004 movies. Congrats on being selected to write a superhero story for audiomachine ebook. I would not be able to do that. I still like the Frank Sinatra one best. I am delighted to say Spunky and I met f2f last September. Didn't have a lot of time with her sadly. I liked the Incredibles too. Funny movie. Didn't like Shrek II as much as the first one. Couldn't get on with The Passion of the Christ at all. Our gas is now $1.37 a litre. The Ocean's movies are pure entertainment! FB only ten and already on the way out? Congrats on the audiomachine opportunity! Congrats on the audio gig! Enjoyed a few of the movies on your list. Creating a super hero...that's a challenge. I'll be stopping by Diane's and Rachel's sites today. Alex- I wish I could remember 2004, I only remember the best and worst of years. Perhaps I wasn't here, as usual. Hey,yay for Diane, she's lovely. I'm now following Rachel. I thought her name was Rachel, but I can't remember - I'm heading for another year that's going to be forgotten. No, I'll remember this one - what year is it? Yeah, definitely a fan of the Ocean movies. Love the ensemble cast. They always look like they're having so much fun on and off screen. My husband had me watch the original a few years back, and I loved it! Hard to believe Facebook has been around for 10 years. I still haven't watched any of the Ocean's movies. I've got to do better. Congratulations on being a contributing author to the first ever audiomachine eBook - sounds very intriguing. A watch to Diane and Rachel. I think the casting for Ocean's was inspired. They all work so well together. Congrats on contributing to the ebook! That sounds awesome! LOVE Shaun of the Dead!!!!! Yay for Diane and Terri! That's a cool opportunity for the superhero contest. I've watched Face Off before, but not the new Creature Shop yet. Jim Henson’s Creature Shop Challenge sounds awesome! I can't believe they are finally going to make an Incredibles 2, it's about time! I thought Oceans Eleven would be the stupidiest movie of the year. Saw it later on cable and thought it was one of the best. Funny how things work out. Lots of great movies. Shrek 2 is one of my all time favorites. The incredibles is a favorite of both Lana and I.
I LOVE most of those movies! what a year! Love the Ocean movies! Following Diane and really enjoy her blog. It's crazy to me that Facebook has been around 10 years. Time flies. 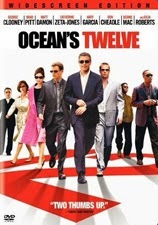 Very entertaining Ocean's Twelve! Somehow reminds me of The Magnificent Seven! I have never even heard of the Creature Shop Challenge. Where do you find these shows? I'm glad to hear the 2nd Oceans was as good as the first. Haven't gotten around to that one yet. Cheers to L. Diane's & Rachel's 2004 new beginnings! Soundtrack to Your Escape - definitely one of the best from In Flames, although I'm slightly more partial to its predecessor, Reroute to Remain. Loved Ocean's 12 but... Shrek II came out TEN years ago? Why does that mess with my head? The Ocean movies were fun. Had no idea they were that old. I've watched two of the Ocean's movies while in Las Vegas and it really adds something to the experience. I wonder if that would be true of other movies? Anyway, Diane's awesome, but I haven't met Rachel yet. Very cool news Alex. Love the Ocean movies and the humor:) Love the Incredibles and Edna. "No cape!" Congratulations on being a contributing author to the first audiomachine ebook! What an honor! In some ways, 2004 seems like centuries ago. I liked (but did not love) the Ocean movies as I'm generally not a fan of remakes. The original? So much cooler. 2004, a year of contrasts between The Incredibles and Shaun of the Dead! Diane and Rachel are a couple of my blogger heros. I just saw Ocean 12 a couple of months ago for the first time. Yeah, sometimes I am VERY late to the party. That bit where Julia Roberts has to impersonate Julia Roberts. Hilarious. And Bruce Willis is also very funny. Good movie!!! A lot of amazing movies! I really enjoyed the Oceans movies, and The Incredibles. Grats on the audiomachine eBook contribution! I'll have to see Ocean's Twelve now. I loved the other ones. Facebook launched in 2004? How fast it has taken over the world. I do follow Diane, but will have to check out Rachel, too. And how did you beat Gary out of first place at The Write Game this morning? I think he's home sulking. The Ocean movies are some of my favorites! And I saw all the other movies you mentioned, which means I probably deserve some type of major award. 2004 was a year of growth and recovery for our family after a huge loss in 2003, so I always think of it as a(nother) year of new beginnings. I was surprised by how much I enjoyed the Ocean movies! They're not usually my thing! Congrats on being one of the contributing authors to the first ever audiomachine e-book. Of Course I follow L. Diane... That's a given.. LOL. I don't know Rachel but will check out her blog. COOL contest. Writing about a super hero.. Hmmm. I may have to try that. I'll never forget 2004! It was the year I sold my house in Florida and moved to Chicago! What was I thinking?!!!! This winter nearly killed me! The circle needs to be complete so now I am selling my condo here and moving back to Florida the minute it sells! Never watched Shrek 11. Heading over to Diane's for a stop in. Yes, the Julia playing Julia moment is one of my favorites of all time!!! I love those movies :) I just can't believe it's been ten years since it came out! Rusty, I wouldn't know where to begin. I admire their talent. Elsie, it's good, I promise. Carolyn, glad you enjoyed it! Rachel, you're welcome! And they were fun to put together. Rachna, I hope I can! Jo, cool you met her. Lynda, sorry the year before wasn't good. Michale, and now you are moving back! Congratulations on contributing to Jim Henson’s Creature Shop Challenge. That is a great thing. I didn't go to the movies much in 2004 which is odd. It was a great year, but not as good as 2003. I became a grandmother for the first time. The Creature Shop Challenge sounds really cool for the right person/people. Wow, Facebook is ten years old. Time flies. Prisoner of Azkaban is my favorite Harry Potter movie. Followed closely by Deathly Hallows 1 and 2. You know what's scary? I have been on Facebook almost since the very beginning! Having all of my top 6(Matt, Julia, Brad, George, Don, Catherine) actors in one movie and the sequel to one of my top 20 movies, of course, I was going to see it, but, I would have been happy with just Oceans 11 and 13. You pointed out the best part of with Julia. Another funny scene was with Linus' (Matt Damon) parents. The Creature Shop Challenge sounds exciting. And this was a busy, busy year. Loved the Harry Potter movie. Haven't seen the others. 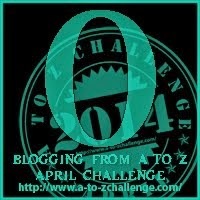 Trying to keep up with the amazing alphabet challenge. Yes, how ironic. Green Day and American Idiot One of my favourite songs. I like, Canadian Idiot, by weird Al. Diane is one Spunky lady! Samantha is a genius and wish she'd get more comments on her wonderful blog. Congrats to you, Alex, for be a contributing author to the audiomachine eBook. I didn't join facebook until 2008, so I could add my new university friends on it. I can't believe it was launched 10 years ago. Thank you, Alex! I wasn't expecting this. Hugs to everyone who left a nice comment. I love that Chevelle album. Shaun of the dead is great, of course the zombies 'turning' are really what makes this movie worth watching, right up Jeremys street. 2004? My gr-daughter was born, Miss Lilian. Loved Shaun of the Dead, The INcredibles, and Hellboy. Passion of Christ moved me, and I am stronger than ever in my beliefs. Oh, my youngest daughter Mary wed Richard in Chambridge England. 2004 was the year we went on our crazy walking trip from Amsterdam to France. Quite a year. Rachel and Diane are awesome. I know some guys that should totally try to get on Creature Shop as they make the coolest puppets. Finally saw Ocean 11 last year...heh. Creature Shop sounds like it'd be fun! LOVE the idea of adding what else happened in 2004 while writing about Oceans. Time or interest in gardening and related topics?? ?come see me. Oceans Twelve was a good movie. My husband and I have watched it several times. I agree, Oceans Twelve was amazing. Chrys, it's one of my favorites as well. Kyra, almost as scary as the fact I'm still not on it! Sydney, that was a riot. Gary, that's funny. And thank you. Big year for you, Susan! I wonder if the year will come while watching the Super Bowl we WON'T talk about that wardrobe malfunction. The Prisoner of Azkaban was my favorite HP movie. I love Gary Oldman. I've seen the first two Ocean's movies, but not the third, yet. 2004 was a big year for me as we moved from Texas (where we lived for 18 years) to Georgia. Both of my kids being raised in Texas, it was a bit of a shock for them to live in Georgia. Now, ten years later, neither one of them live here anymore! Yikes! There may just been too much epicness in this post. I love Rachel and Diane, and I've thought about entering Samantha's challenge, but time is a fickle thing. And wait, did you mention The Incredibles? And when are they EVER going to release the sequel? Hello! I rather liked Hellboy, he and his girlfriend made me laugh with their one liners. I follow L. Diane, she's a great photographer, too. Good luck on your latest venture, Alex. Diane and Rachel are both great. It seems so weird that the infamous wardrobe malfunction was 10 years ago already. I hope you are doing well Alex! The Creature Shop Challenge sounds really fun. I wish I had the kind of creative skills to do something like that, but I'm satisfied only being an amateur artist who likes to draw and paint simple things. Loved American Idiot and it still ranks as one of my favorite albums ever. I could listen to the title track over and over. Love Diane! She is amazing. The first "Oceans" movie I saw was actually Twelve. I saw the DVD on a shelf in the grocery store and decided to pick it up. LOVED it and just had to watch the rest of the movies thereafter! And Spunky is a great, great, great, great, great, great, great, great, great, great, great person!!! I definitely enjoyed Ocean's Twelve and Diane has been a HUGE help to me. Creature Shop Challenge looks like a reality show I'd enjoy! Facebook went live in 2004? It feels like it's been around for longer. Has it really been ten years!!! since that happened??? Wow. This old age thing is a fast and slippery slide! Loved the Ocean movies! And the creature shop sounds fascinating, even if I haven't a lick of imagination in that direction! Actually, quite a lot happened that year, didn't it? You make it seem so! You have been selected what??? for WHAT??? How wonderful!!! HOORAY! Congratulations! And I think The Incredibles has to be one of my favorite animated movies. Your fun facts are making me miss 2004! Lisa, Georgia will do that to kids. Crystal, thanks! There is finally a solid rumor about a sequel. Melissa, did you happen to catch their American Idiot tour? Seeing all these events lined up under one year is so weird. Because on the one hand, I can't believe it's already been 10 years since Ocean's Twelve came out. But on the other, it seems like the Wardrobe Malfunction has been part of our culture for soooo much longer than ten years. So it's crazy to think these happened the same year. No Ocean movies for me, thanks. But I remember going to see Shaun of the Dead in the theater. Plus WoW. I can't believe it's been ten years. I've never seen so much positivity about Oceans 12. Personally I preferred the Frank Sinatra one. Congrats on the audio book. I liked Oceans 12 but I don't think I watched the others. 2004 my oldest son graduated from high school and started his college football career which we really enjoyed. I'm reading all the lists and thinking it seems so long ago, and it hits me... Nine years ago, to be exact. Remember the series Millennium, in 1999? It was about a psychic FBI agent. It doesn't matter, my point is THAT was a long time ago. Anything since was only yesterday. Oh, the series was filmed in Vancouver, BC. Same place they filmed Dark Angel and Fringe. Love the Ocean movies- very fun! what the heck was I doing in 2004??? Well for one thing I hadn't started my blog. MY goodness!What did I do with my time!!!! I do think Ocean's 12 fell a little short...but the scene where they trick Damon with their nonsense speek. Priceless. Jocelyn, really messes with your perception of time, doesn't it? Susan, thanks, and I bet that was fun. Joylene, with Lance Henrickson - I do remember that show. Wow, Facebook in 2004? I can't believe it's been that long! I'd love to write a superhero story! Sounds like fun. 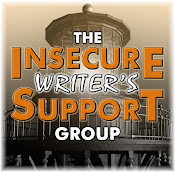 My critique group, Raintree Writers, was formed in 2004. Love The Incredibles. A movie has the best potential, I think, when it has things to draw the parents as well as the kids. I can't believe it's been ten years since all those things happened! Yay for Facebook! Boo for the wardrobe malfunction--yikes! 2004 was a bad year for us: my brother died in tragic circumstances. It was one big smudge in history. No clarity in that year. I really don't remember what movies were out. And it's ten years away? How? Gas prices are on it's way to $4 now too. That's just sad. Are we the waiting? Unknown. River Fairchild's book covers are nothing short of awesome. I never got a chance to see Ocean's Twelve. I wanted to because I enjoyed Ocean's Eleven, but it just never happened.